It’s the beauty and the bane of every sewist’s existence: managing our fabric stash. This entry was posted in Bags and Cases, Events, Fabrics, Project Planning, Trousers and tagged Weekend Duffel on January 26, 2015 by mportuesisf. No, I’m not giving up on the pants fitting project. But I did purchase a brand-new sewing machine over two months ago, and I’ve basically been using it to sew pants muslins with a basting stitch ever since I got it. It would be nice to have a project that doesn’t involve fitting at all, one where I can just sew. My day job, for better for worse, has me taking the occasional 1 or 2-day business trip. Not being a traveler, I have little in the way of luggage. 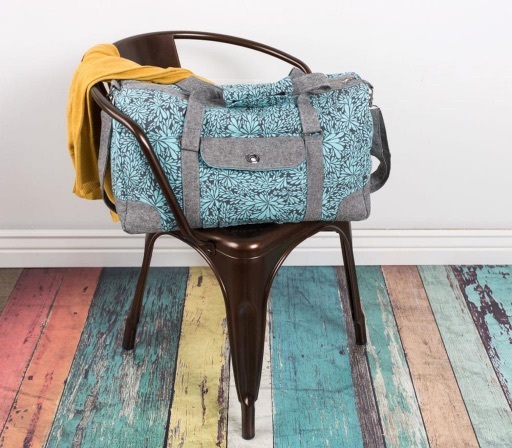 A bag that could accommodate necessities for an overnight trip would be a handy thing to have. I spotted the Craftsy course, Sew Better Bags: The Weekend Duffel about a month ago. When Craftsy had another $19.95 sale on all classes around Christmas, I went for it. The bag pattern, by instructor Betz White, is well thought-out and has lots of nice details that give it a professional appearance. Here’s a model photo I stole from Craftsy’s website. This entry was posted in Bags and Cases, Project Planning and tagged Weekend Duffel on January 18, 2015 by mportuesisf. Since my last article on the Vogue 8940 pants muslin, I’ve been taking an online course in pants fitting which has been really helpful. PatternReview.com was offering its online course “Fun with Fitting: Pants” on sale over the holidays. It’s taught by Sarah Veblen, a fitting expert who is author of the book The Complete Photo Guide To Perfect Fitting (Amazon link). Reader David Coffin suggested it to me, and I’m glad I followed up on it. What I really like about the class is that it takes a conceptual approach, rather than a “spot this problem, apply canned solution” approach. A big problem I’ve had with fitting is that I invariably wind up with a situation that doesn’t match anything depicted in the reference I’m working from. This entry was posted in Classes, Pattern Alteration, Pattern Fitting, Reviews, Trousers and tagged vogue-8940 on January 14, 2015 by mportuesisf.